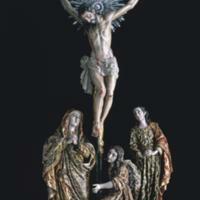 This multi-figure sculpture represents the events of Calvary, the hill where Jesus was crucified. The body of Christ has been rendered in detail, including his bloody wounds. 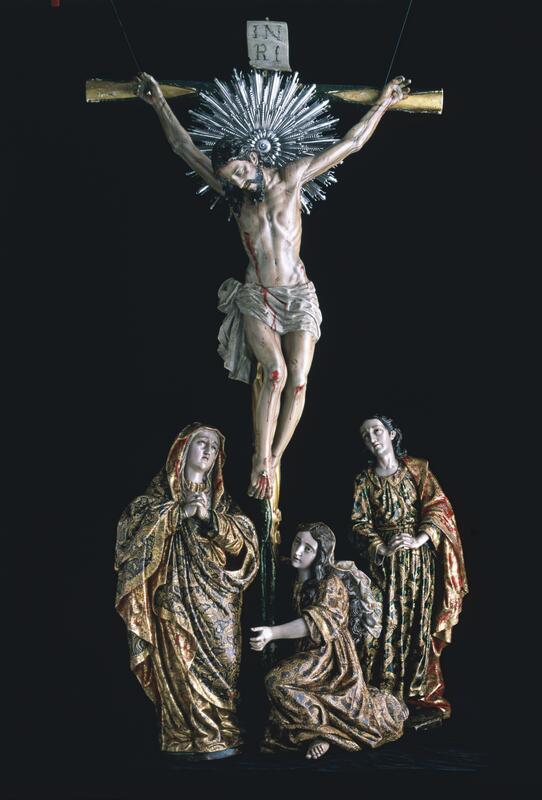 Below him, the Marys and St. John express their grief through their postures and anguished facial expressions. The high level of artistry in this work was typical of fine sculpture made in Guatemala in the 18th century. The body of Christ bears the wounds of Crucifixion: nails pierced his hands and feet and the spear of a Roman soldier his side. The smooth body of Christ has been sculpted to convey his humanity—with muscles, tendons and veins visible. To the right is St. John, whose robes are rendered here in gold, green and red, and capture the sense of luxury Guatemalan sculptors could create with paint, wood, and gold leaf. To the left of the cross, the Virgin Mary, the mother of Christ, appears with hands clasped, her brow furrowed as an expression of her distress. At the foot of the cross, Mary Magdalene, recognizable by her long, flowing tresses, visibly weeps. This image, which represents high-level craftsmanship for 18th century Spanish America, was probably created in a workshop in Guatemala. In keeping with workshop practices, it is likely that more than one sculptor contributed to the completed piece. Each figure was composed of several pieces. In addition to carving, the robes were worked in estofado, a technique at which Guatemalan sculptors excelled. Estofado involved covering a statue’s clothing in gold leaf and then painting over the gold with color. The colored paint was then scratched away, often in elaborate and delicate patterns, as is the case here, to create the effect of richly brocaded cloth. Introduced from Spain, estofado remained popular in Spanish America through the 18th century. Guatemalan sculpture was exported widely throughout New Spain. Today this piece is housed in Mexico City, in the Museo Franz Mayer. Images such as this were typically installed in small shrines in a church or a chapel in the home of a wealthy family. The intense grief of the mourning figures, as well as the clearly tortured body of Christ, would have inspired powerful feelings in those prayed before these figures. The drama of the sculpture was thus meant to evoke not only a crucial event in Christian history, but also deep passion and belief among the living. García Saiz, María Concepción. 2002. “La escultura en Guatemala.” In El país del Quetzal: Guatemala maya e hispana. Madrid: Sociedad Estatal para la Acción Cultural Exterior, 139-151. The Grandeur of Viceregal Mexico: Treasures from the Museo Franz Mayer/ La grandeza del México virreinal: tesoros del Museo Franz Mayer. 2002. Houston. Texas and Mexico City: The Museum of Fine Arts, Houston and Museo Franz Mayer.